Loham, one of the much expected movie of the year. As the Renjith and Mohanlal duo is together again in ashirwad banner. So the expectations must be huge from the audience side. Brilliantly executed story and screenplay by keeping the curiosity of audience up without going down. If thrillers were only meant to be full fledged action oriented then this film is a standout from others. Great to see such a classic big time entertainer from Mohanlal-Ranjith combo after a long back. Opening shows giving a positive feedbacks and its almost assure that this will be the box office winner of the Onam season for sure. When the movie completes the first show, the audience suggests that Loham is a very different action thriller that not seen yet from Ranjith and Mohanlal. According to the initial reports, the first half of the movie is too good and end with an thrilling interval twist and fun filled. Later, the second part of the movie progresses with slow pace and some of the situations are predictable and then its getting into a finishing race. Meanwhile we will felt like the crew tried to complete the movie as quickly. Mohanlal has completely maintain to keep the expectations up and gave his fans a onam treat with his power-packed performance. Apart from Mohanlal, it is Siddique who has been receiving good reviews for his screen presence. As usual no words to describe mohanlal’s performance. After so many box office breakdowns, this will be a comeback movie for him. Andrea Jeremiah, the singer-actress plays female lead, a young woman who comes to Kerala with a purpose. Andrea is sharing the screen with Mohanlal for the first time. Loham is rich with a very strong supporting cast, including the popular actor Vijayaraghavan, Siddique, KPAC Lalitha, and so many. As all performed well and Siddique getting more appreciation from the viewers. And as about the cameo appearances , Loham is rich about that also, the popular young actors of Mollywood, including Pearle Maaney, Aju Varghese, Srinda Ashab, Manikuttan etc will make special cameo appearances in the movie. The director-Writer Ranjith made a comeback to the action-thriller genre with the Loham, and is so appreciable. Kunjunni S Kumar, the son of popular cinematographer S Kumar, handles the cinematography and most of the captures by him gives the movie a positive impression. Manoj Kannoth handles the editing. Liji has designed the costumes for the movie. Songs are composed by popular musician Sreevalsan J Menon. Rajamani composes the background score for the movie. Somewhere the BGM not giving much impression for the thriller genre of a film, but some how it overcomes with the powerpack performance of Mohanlal. Prime focus is one Ranjith - Mohanlal duo. As they doing a movie after 3 years. The last movie of these extreme duo was critically acclaimed superhit “Spirit” released on 14 june 2012. On other end a fabulous casting includes Mohanlal, Andrea Jeremiah, Siddique, Vijayaraghavan, Renji Panicker, Abu Salim, KPAC Lalitha, Mythili, Joju George, Gauri Nanda etc in lead roles. Pearle Maaney, Srinda Ashab, Aju Varghese and Manikuttan appears in guest roles. 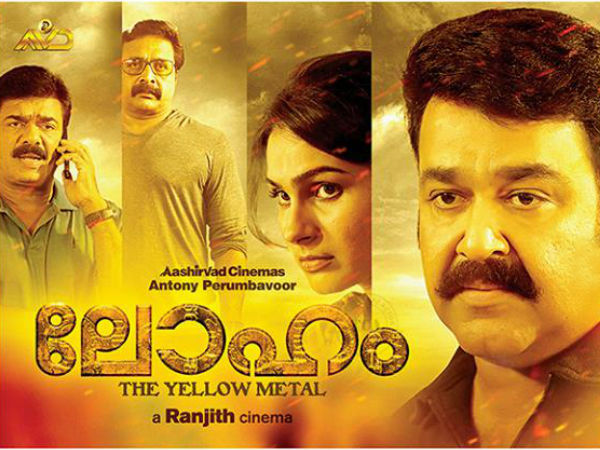 We can see Mohanlal back in his action avatar after a very long break in this movie. As per the latest reports Mohanlal will be appeared in two different shades of a role. Super glamorous Andrea Jeremiah is sharing the screen with Mohanlal for the first time in her career. Fans eagerly waiting to watch their chemistry on screen. Srinda will appear in a glamourous role, unlike in her earlier films, said the actress. Srinda will be doing a dance in wedding song sequence with Manikuttan. Actress Mythili, who is a close friend of Srinda, approached her for doing the role. Srinda is very excited with the role as it different from her usual non-glamorous roles. Actress Mythili debuts as assistant director through the film Loham. Mythili will also appear in a lead role in the movie. Mohanlal is doing moustache-twirling in Loham after a long time. Mohanlal fans are waiting for such a movie and their anticipations are more. So whatsapp….now its the time to watch it…..